Villa Bílek was designed in 1911 by sculptor, master craftsman and architect František Bílek; it is in a mixture of Art Nouveau and Symbolist styles, of which he was one of the leading Czech exponents. 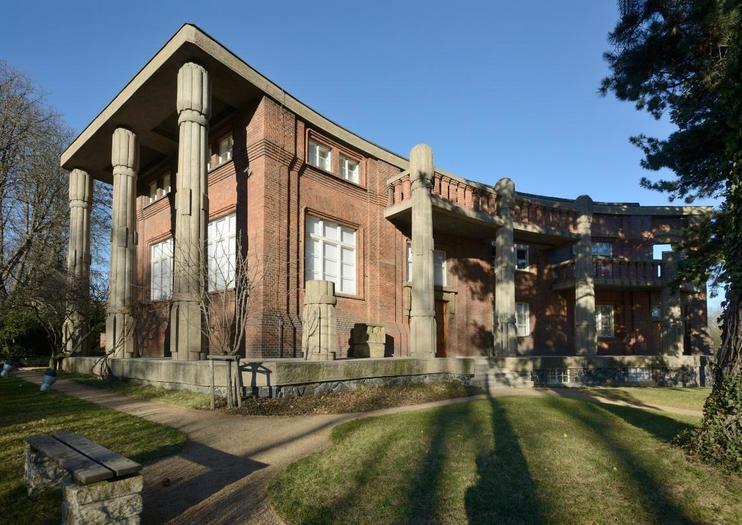 Constructed of red brick and carved stone columns and reminiscent of an Ancient Egyptian temple, it is crescent shaped and was designed as a family home and studio. Bílek lived between 1872-1941 and it was his heartfelt wish for his ornately decorated house to become a museum of his work. In 1963 his hopes were realized and today the villa is under patronage of Prague City Gallery; its exhibits include the artist’s studio, where some of his most famous works are displayed; a museum of his religious sculptures; displays of his hand-crafted Art Nouveau furniture; and a series of temporary exhibitions. Recent shows have included drawings and sketches from Bílek and his Art Nouveau compatriot Alphonse Mucha. The house where Bílek was born in Chýnov is also under the stewardship of the Prague City Gallery, along with five other historic properties including the House of Photography in Prague Old Town and the fabulously Baroque Troja Château in Prague 7. Villa Bílek is an easy walk from the treasures of Prague Castle in Hradčany, where the sculptor’s ethereal wooden Crucifixion is on display in St Vitus Cathedral. The museum is open Tue–Sun 10am–6pm. Admission for adults is CZK 120; seniors are CZK 30; students & children are CZK 60. Admission is free with the Prague Welcome Card. For access via public transportation, take Metro Line A to Hradčanská.